Colmenar Malaga - Getting from Malaga airport to Colmenar. One of the typical white villages in the province of Malaga situated in the Axarquia region and 30 km away from the capital city of Malaga. The origin of Colmenar’s name comes from the main engine of its economy for many years, the beehive, which in Spanish it’s called ‘colmena de abeja’. Colmenar is situated right in the heart of the Malaga Mountains, which is why we not only will enjoy the beauty of this village, but also all of its monuments and different sites of touristic interest. Remember you can hire a car or book a bus or taxi transfer to Colmenar from us. 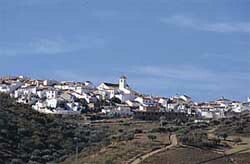 Colmenar has had inhabitants in its area since the Prehistoric period. They have found remains of tools in some caves and tombs that date way back to ancient times. They have also found several discoveries that also suggest there was a roman settlement, amongst them there were coins and ceramics, although archaeological remains have not been found yet which means this theory is only a hypothesis. However, testimonies of its Arabic past have on the hand reached our time, as well as archaeological remains in different points of the municipality. Colmenar didn’t have a sufficient population centre until the late 15th century and it was initially made up of farmhouses, although it was always a place of passage in the olden days, up to the point where many of the motorways and cattle roads today, use many of the existing roads from the Roman-Andalusian period. Like in other places conquered by the Christians after their presence in the area, they constructed buildings belonging to their own religion like the church for example from the 16th century, or the chapel that although it was built in the 18th century, it has a curious story to it...in the year 1700 some sailors were caught in the middle of a storm off the Malaga coasts, these men carried out religious rites to a virgin according to the beliefs back then promising the construction of a chapel if they were saved, and after surviving they kept their promise; later on, this chapel became a convent. Colmenar hosts many customs and traditions, some modern and others that have persisted over the passage of time till the present. The castration of the beehives: This task is carried out handmade, just how it was done in the olden days. The slaughter: A tradition extended around many villages in the province of Malaga, that consists in singing and dancing whilst participating in the elaboration of meat products. The grape treading: Dancing on grapes to produce the wine. We also recommend a visit to the "Casa Museo de la Miel" (the honey house museum) where you’ll get the chance to see how the beekeepers used to work centuries ago. Mornings: from 10:00 h. to 14:00 h.
Afternoons: from 15:00 h. to 18:00 h.
You must head towards Casabermeja and from there follow the signs to Colmenar. We recommend to drive there as using public transport can turn out to be a long tedious journey. If you don’t have a vehicle of your own, you can hire a car in Malaga and pick it up either at the airport or at the Malaga train station. Another option is to book a Malaga airport transfer to Colmenar. You can follow the recommended route on the map below to get to Colmenar from Malaga. Official website: Ayuntamiento de Colmenar.